The location was in Crystal City, Virginia in front of a Hotel on a very busy street. The "Take It!" I had gotten back into my car and was doing the regular get ready to go things, like putting on my seat belt, when I happened to look out the side window and there was the wonderful sliding shadow. I unlatched and got out and took a number of photos of this easy to look at composition. 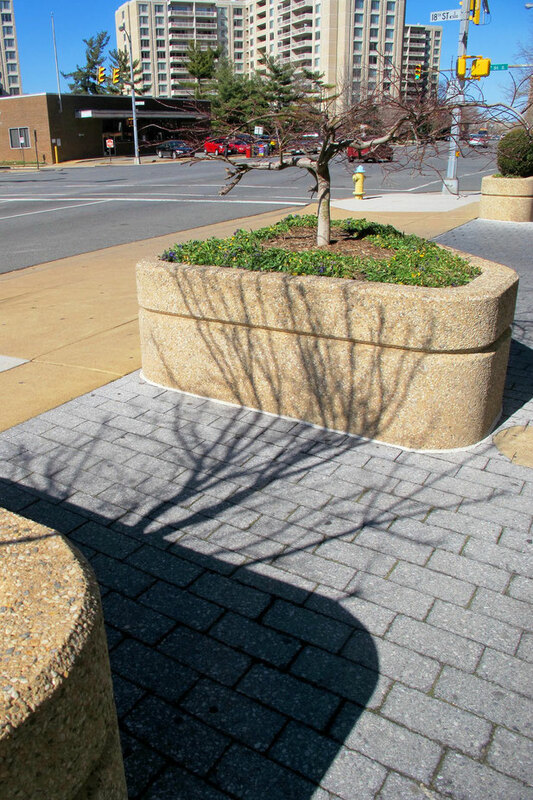 The fact that the shadow from the tree in the planter on the left could make its way over to the next planter by sliding across the paving blocks to the next planter over and then go up the side and over the top sort of gives me a sense of these two planter bound trees are possibly old friends that through shadow get a chance to reach out and for a few moments share a touch. The After Take: This is another "take some time with it photo." That all this action is happening in front of a busy building entrance at a busy intersection makes it all that more special. The strong swath of shadow from the first planter on the left is an enjoyable accent. I sometimes wonder if the plant world allows for communication to one another. Nature certainly is providing a way of touching via shadow caught in this photo. I cannot help but wonder if the second tree is able to reciprocate at a different season and possibly different time at that season. I will watch to see and report to you my findings. The luxury of viewing all this and being able to share it with you still amazes me. Thanks for your time. That is an interesting theory Bruce! Weather looks really nice too. Compliments the picture.